People LOVE Point Arena, the Point Arena/Stornetta Public Lands and (of course) the Point Arena Lighthouse! KidTripster visits the Point Arena Lighthouse as part of its Mendocino Coast Road Trip! KidTripster’s Shellie Bailey-Shah and her family took a great road trip up the Mendocino Coast and her kids loved the Point Arena Lighthouse Tower. Check out the full road trip story! Visit California compiled a video showcasing many of its favorite beaches along the North Coast, and the Point Arena Lighthouse was part of that visit! 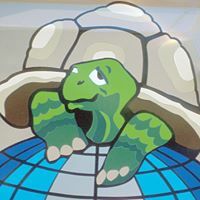 We are featured on the video, along with Manchester State Beach, Glass Beach, Goat Rock and others. Check it out! Kate Loweth recently took a road trip with her family through Mendocino County and wrote about the many wonderful adventures they had, including visiting the Lighthouse. Her article “Road Trip! Head North to Mendocino County” details their trip and is definitely worth a read. 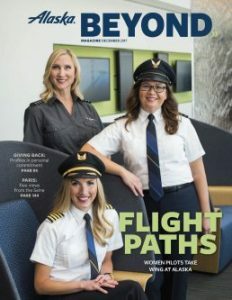 Margaret Lindgren of Unbeaten Path Hiking Tours was a key part of getting an article titled “Explore Marvelous Mendocino” in the latest issue of Alaska Airlines/Horizon Air in flight magazine, Beyond. It features a great photo of the Lighthouse, and author Matt Villano covers many of the beautiful adventures available from Fort Bragg to the Point Arena-Stornetta Unit of the California Coastal National Monument. Top 10 Unique Vacation Rentals in the West! SFGATE, the internet site of the San Francisco Chronicle, featured the Point Arena Lighthouse’s Keeper’s Apartment in its list of Top 10 Unique Vacation Rentals in the West. Check out ALL of our unique vacation cottages and stay at the Lighthouse! 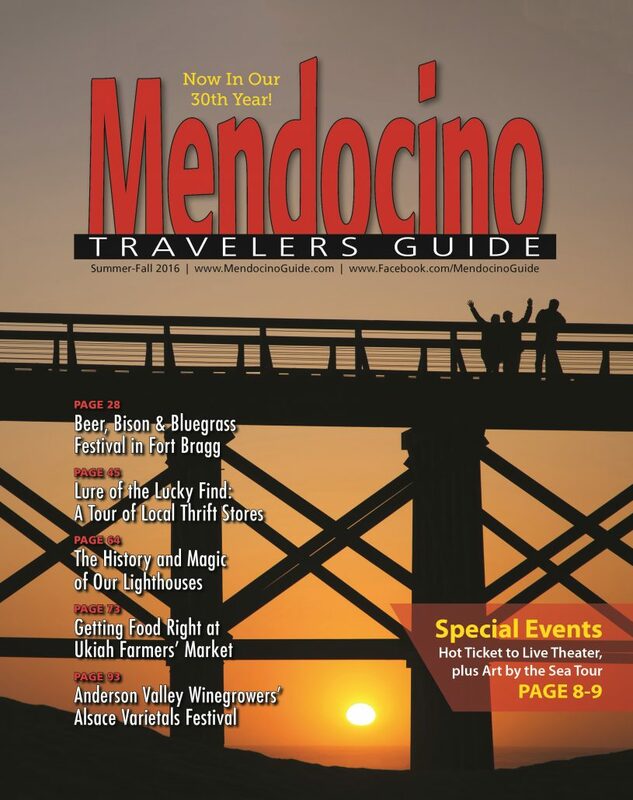 The Mendocino Travelers Guide Summer/Fall 2016 issue has a great article by author Carole Brodsky about the Point Arena Lighthouse and the Point Cabrillo Light Station. Check out this informative and interesting article, and pick up a copy of the Guide starting in August at most local markets, inns, visitor centers and (of course!) the Lighthouse! 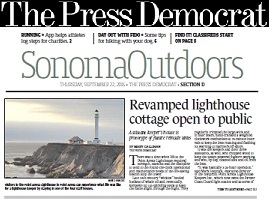 The Santa Rosa Press Democrat wrote a great article about the newly remodeled Assistant Keeper’s House 4 in its September 22, 2016 Outdoors section. The article included interesting history of the Lighthouse and an invitation to visit the House 4 Heroes Open House on September 25, 2016. Gary and Monika Wescott of The Turtle Expedition crossed off one of Monika’s bucket list items when she celebrated her birthday by staying in the Keeper’s Apartment at the Lighthouse. You can read all about their stay and see some great pictures of the stormy weather they enjoyed by reading their blog entry. It was such a treat to meet them and talk to them, and we look forward to their return – to coincide with a Night Tour! Website Weekend Sherpa wrote about their recent stay at the Point Arena Lighthouse and their experience watching our wonderful gray whales pass by the point. Great photos on both stories! This article rightfully lists visiting the Point Arena Lighthouse, Fog Signal Building and Museum and 23 acres of grounds as one of the 25 best things to do on the Mendocino Coast! This article features a wide variety of stunning pictures of the Lighthouse, the Fog Signal Building, Museum and grounds. This article features some beautiful pictures of and from the Lighthouse, and features information on our southern neighbor the Point Arena/Stornetta unit of the California Coastal National Monument. This article features wonderful details about the Lighthouse, its history and the views from the top of the tower. 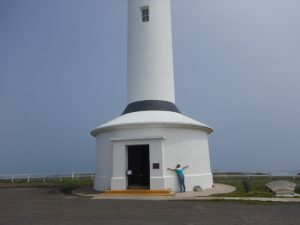 This article features pictures and information about the Lighthouse and its vacation cottages, wonderful details about the Lighthouse, its history and the views from the top of the tower. It also covers the Point Arena/Stornetta unit of the California Coastal National Monument and the town of Point Arena. Photographer and blogger Angela Andrieux visited in July and added photos from her visit to her blog. To all the lighthouse staff a big thank you from our family! Our reunion was awesome! The accommodations were perfect for our needs. The house are clean, well stocked and comfortable. The entire staff is friendly, helpful and professional. Even Arena Mina! ^!^ My husband and I are already planning a fall trip so we’ll see you then! I just wanted to say thanks! The bidders who won last year’s auction for your location, contacted us letting us know how much fun they had and how much they enjoyed your location. They were very specific about the amazing experience they had and just in case they didn’t express this to you directly, I thought you would like to see there note. I included their message below along with some photos they sent. I can’t tell you how happy it makes us to hear back such nice things! Hi Rich, this is Cynthia and Fred and we won the bid to stay at Point Arena Lighthouse from the US Lighthouse Society Fundraiser back in November. You asked for a review of our stay so here it is. We had a great stay May 2-3! Tuesday May 2, we drove over to the Point Arena Lighthouse to stay for 2 nights. Tuesday we drove over to the Point Arena Lighthouse to stay for 2 nights. We arrived on a gorgeous sunny cool day and checked into our 1960’s vintage Coast Guard apartment labeled The Head Keeper’s Quarters. It was very spacious with bedroom, bathroom, large equipped kitchen and large living room with a wood burning fireplace. The best part was the fantastic views out both sides onto the ocean and flowered bluffs. To see the tallest lighthouse (115 feet) in CA we had to step out the front or back door to see her light flashing every 15 seconds from a modern stacked halogen light mounted outside the lantern room. 145 steps to the top where the spectacular 3 sided double bullseye clamshell first order lens used to reside. She is very nearby in the foghorn building that was remodeled to their lovely museum which also houses more exhibits and gift shop. That afternoon we hiked around the nearby bluffs admiring all the beautiful spring flowers in the sunshine and breeze. The lighthouse was closed to tours till the next morning. We awoke to fog and climbed the tower for a tour anyway. We were met at the top by Josh, a very nice young man who told us all about the lighthouse and answered our many questions. We got to walk outside on the catwalk in the cold fog and wind but could faintly see to the ground and ocean. We had a nice chat with Josh about our lighthouse keeper experiences and I mentioned I like to play my violin at the top of them when I take care of them. I had my violin in the apartment but didn’t want to push it about playing. Then Josh got a radio message about a school group coming up for a tour – our cue to depart! That foggy afternoon we drove not far to hike some bluff trails and made it down to a rocky beach to find wonderful pieces of abalone polished form the surf. We hiked across a spectacular natural bridge to a bluff island island and viewed sea caves being pummeled from the ocean surf. We continued back to the mainland bluff trails for more spectacular flower strewn hiking. Took a drive down to the tiny seaside towns of Point Arena and Gualala. Near Gualala we had sunshine and hiked down to a little cove to a sandy beach. On the way back to the lighthouse we stopped for dinner at Point Arena Cove at the Chowder House – yum! Back we went to our Keeper’s Quarters, closing the gate and enjoyed some TV with a roaring fire. We stepped out in the peaceful, quiet night to see HER blinking light before retiring. The next morning it was sunny! But the fog started to move in again as it often does. We went up again into the lighthouse for another tour with Josh who was happy to see us again. It brightened a little bit and we could see more from the top than the day before and more detail in the Devil’s Punchbowl at the end of the peninsula. Josh mentioned to me that it would be nice if I could play my violin on top and I said “well it’s in the car – CAN I !!!!!!! Cynthia and Precious playing in the Tower! He said sure and so we ran down the 145 steps we just came up and retrieved my Precious and music and ran back up. There was a young couple on top getting a tour and they were amazed that we ran up, down and up the steps. I quickly pulled out Precious and tuned her in the humidity and started to play Ashokan Farewell to warm up. Josh and the couple stopped and stared at me but I got used to it and played it once more – much better -HA! Fred took pictures. I was sitting in the more sunny side on a bench and had my music propped up on a folding chair. It was quite warm up in the lantern room but I continued to play my favorite childhood concerto – Concert in a Moll by Vivaldi. I hadn’t played it in a while but it went Ok even though I was a sweaty mess from the heat in the lantern room. 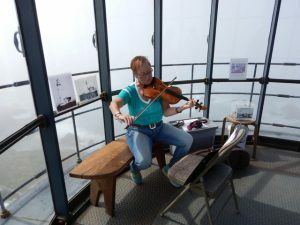 I was so thrilled that Josh let me play in that precious tower and could feel that she enjoyed it too – I even hit the harmonic near the end – Yes! The Lighthouse gets a hug! I packed up Precious and thanked Josh again (it does mean so much for me to play in these precious and proud structures that still silently guide us to safety) and we scampered back down just in time since he got a radio call that he had another tour coming up – perfect timing. I gave the lighthouse a heartfelt hug and we happily drove off to a local ranch store where I could buy some local gorgeous yarn in 5 colors to knit something special. Off we went down the coast stopping for more little hikes on hidden beaches and our packed lunch overlooking a spectacular bluff. Onto vibrant San Francisco we went. We had a great visit with you this weekend. The Keeper’s Room is so nice and what great views. We didn’t remember the door with the full length glass in it, so that we could see the lighthouse at night. We were surprised by the half bottle of wine and the chocolates, what a nice touch. Also, I didn’t expect a hair dryer in the bathroom. You’ve done a very nice job making the place welcoming. Thank you for a great stay (we really lucked out with the weather to boot!). We’ll return, for sure. I’ll be sure to give you a good review on TripAdvisor. My son, my niece, and I stayed in the Assistant Keepers House 4 for one night in early August. We were the first guests in the newly remodeled space. I’m stunned! I’ve stayed at many of the world’s finest hotels including the Ritz in Paris and several Four Seasons. They all live up to their standards. But, when a place charges you far less and way over delivers, then I must praise them. The Point Arena Lighthouse and our 3 bedroom home for the night was stunning. I’m still smiling and the kids are still giggling at the amazing fun time we had there. The house was amazing. The renovations are top of the line (I’m rather used to pretty nice places). If you’re debating on which of the several cottages to stay in, then debate no further. Number 4 and its fresh renovations are so very very worth it! Oh and the light house is really cool. Its a light house on the coast of California with crashing ocean waves and seals and amazing shorelines and how could you possibly get any better than that! The history is really fun to learn about it. The team of people who run the light house and cottages are wonderful and warm and kind. You gotta stay here! A great history lesson provided by Isaac atop the tallest lighthouse on the West Coast. We stayed in their Asst. Keepers Quarters – a great cottage, right by the sea and lighthouse. A great value for the accommodations. The views can’t be beat – both from the ground and 100+ feet in the air (and it was foggy on the day we trekked up the 145 steps). Some lighthouse guests use the Keepers’ Quarters as a base for exploring the local area. My wife and I explored on the way in and out, but stayed parked at the lighthouse for our entire three-day stay. As advised on the lighthouse website, we bought groceries before our arrival. The kitchen was well stocked with an eclectic set of pots, pans, dishes, tools, cups, glasses, and utensils. We had a nice view up the coast from the kitchen table and southward from the living room sectional couch. The three days were an appropriate mix of clear and sunny, foggy, and rainy coastal weather. The Point Arena Lighthouse Keepers’ quarters were a great place to relax near the end of a long and busy vacation. Had a great time! Was worried we would not have good weather, but our last day was sunny and bright. Loved the location and quiet nights … gave us a chance to unwind. Thanks for making our check-in/out process easy. Made for a fun weekend exploring up North. Thanks for putting everything together for us. We enjoyed staying in the Keeper’s Room. The small, cozy room was perfect for us. The gas stove made it feel warm and comfortable. Hope we can make it back soon. Every other year between Christmas and January 5, I always find the time to spend 3 nights here, Keepers Room. About the room: looking out the door you see the Tower and Museum changing colors and never ending scenery over each earth rotation; a small refrigerator for your white wine, cheese and candy for your ongoing munchies; a TV which was not used; a fun bed, and cool gas-temp controlled fireplace type; and an outside bench to peer into endless space. The daze are blurry, sounds intense, and colors vivid due to the intake of edibles and other treats for the senses; the ocean smells like an ocean, the greens are green and the many shades of blue constantly weave in and out of nothingness, the clouds you can watch for hours because clouds are clouds constantly changing shapes, or were my eyes closed? The wind chill will not prevent you from baking along the never ending fences along the rocky cliffs. The sounds of quiet, and waves crashing against the rocks and cliffs provides all the imagery you need for your eyelid trips! Oooo the singing birds, beam me up Scotty! I come here for the absolutes: winds, chills, make believe but real rain drops, lightening and sky shows, the fog, and to be left alone laughing, laughing and laughing, spinning in circles, skipping, and because doing nothing but enjoying your space is what life is all about. The whales migration – yeah, they do appear and watching them keeps a frozen smile on my face! Definitely an unexpected treasure. Never imagined being able to stay in a lighthouse keeper room. To have the view of a sunrise, sunset, and a lighthouse all from our porch or through the window. The price was unbelievable. If you are in the area this is a must do. I stayed in the Keeper’s Room, the one single room, while the rest are apartments. This room is wonderful for one or two people: a comfy queen size bed, small refrigerator, microwave, small TV, good wi-fi connectivity, a welcome half bottle of good wine and some chocolate. But the VERY BEST PART is the location. This room is at the end of the short row of apartments, facing toward the lighthouse, with a view of the lighthouse through the front door. From a side window you can see the ocean and coast to the north. At night you hear the restful sound of the waves and nothing else. This is a special place! I’m so glad I had business in Pt. Arena and learned of a place I had never known about. I will certainly return again! Highly recommended. We lucked out with the weather during our one day stay at the Point Arena Lighthouse. It is important you wear layers, it can get windy and cold at times. This small room is perfectly equipped: small refrigerator, coffee maker, microwave, TV, wi-fi, DVD player, and a gas stove that is extremely efficient. A half bottle of wine and two chocolates were a nice touch. The room faces the lighthouse and the window on the side faces the hiking grounds. If you stay on the grounds the museum fee ($7.50/ea) is waived. Make sure you spend time at the museum, there is a video playing which tells the history of the lighthouse and the efforts to maintain it. Don’t forget to climb the 144 steps to the top of the lighthouse. For breakfast we went to the Rockville Cafe which is 2 miles away; the closest town is Point Arena — less than 10 min drive from the lighthouse. We just came back from an anniversary trip and loved it. We stayed in House #1. This is a two bedroom one bath home, not a motel unit, and was sparkling clean. Satellite TV, DVD/VCR, a wood burning stove with plenty of firewood, flannel sheets, cute quilts, and lots of “lighthouse” touches. The bathroom had great shower pressure and was spotless. It looks like the interior had been painted fairly recently. If you like privacy, peace, quiet, and the ocean, this provides it. I went outside several times at night to see the surf glow blue and hear the ocean. There are nice beaches nearby, and gasoline and some groceries are available in Pt. Arena, just a few minutes away. No daily “maid” service so if you are there for a few days, bring some extra towels. We had a Great Time. It can be quite cold and windy. You can also see the Lighthouse, day and night, from the second bedroom. My husband and I selected this lighthouse to have our marriage ceremony and we can’t imagine a more perfect place! It has to be one of the most beautiful places on earth. The people there were absolutely so wonderful and accomodating. As one other person said previously, the views you have from your cottage are breathtaking and second to none. We stayed at the head keepers cottage (no#1). It does get cold and windy so bring warm clothes. There are wonderful restaurants in driving distance. We visited St. Orres and were very impressed with both the food and the service. I can highly recommend it to anyone wanted to really get away for a weekend! My wife and I had an absolutely amazing and enjoyable stay at the Point Arena Lighthouse. The views from the rooms were most stunning: ocean to the north, to the south, AND to the west! Crashing waves all around us! We learned that this remote point that sticks far out into the wild, blue Pacific is the closest land-point to Hawaii (Aloha!). Our 3 bedroom 2 bath house-accomodation was simple, but very comfortable and clean sleeping most comfortably to the sound of the wind and sea…What delighted us the most was that the lighthouse manager, Silvia Simpson, was most gracious and was kind enough to take us on a personal tour of the historic tower (115 feet high! )-best vantage-point to view the coast! This is definitely the place to stop if you are travelling up or down Hwy 1! A novel wedding took place at Point Arena last Sunday afternoon. Eugene W. Callnon, First Assistant Keeper of the Light, was married to Miss Florence W. Winfree, of Point Arena, in the lantern of the Point Arena Lighthouse. The occurrence was comical as well as novel. Those inside and outside were ridiculous, as they viewed each other through the magnifying prisms, and laughter could hardly be restrained, and, the officiating minister Rev. George Adams, could scarcely maintain sufficient gravity to complete the ceremony. After the knot was tied, the happy couple and their friends descended from their aerial altar and partook of a most bountiful repast.